“Navaratri “ as the name itself suggests Nine Nights , “Nava” means nine and “ratri” means night. Navaratri is the auspicious Hindu festival celebrated and devoted to nine Goddess . Navaratri festival is celebrated twice a year , once in March/April known as “Sharad Navaratri “ and second one is “Chaitra Navratri” celebrated in month of September/October. During this 9 day long festival , Navaratri nine forms of Shakti/Devi is worshipped .People visit temples , chant mantras and bhajans. Also , many people observe nine day long fast. There are surrounding filled with positivity and joy all through the Navaratri festivities. During Navaratri festivities, people wish each other with Navratri quotes , Maa Durga quotes , Navratri wishes quotes sent through internet messages or wishes each other in person. Navaratri festival are celebrated all across the country in different ways. From most famous Garba dance of Gujarat to Durga Pooja rituals of Kolkata. It is celebrated throughout the country with high spirit & great enthusiasm. Navratri is celebrated different corners of the country so different yet so integrating. During the festival of Navaratri going on everybody is surrounded by brightness and festivities joy surrounding all around. In Gujarat most awaited festival all around the year is Navaratri. It is celebrated as per Hindu mythology in Ashwin month, Maa Durga’s devotees keep nine day long fast and visit temples. 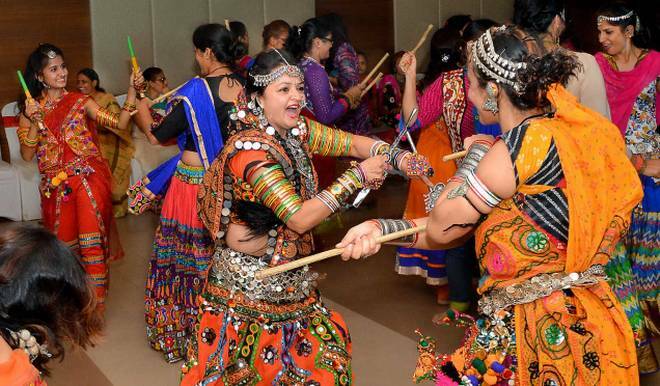 In the evening , wearing traditional dresses all men and women come out together to perform dance forms like “Garba” and “Dandiya Raas”. 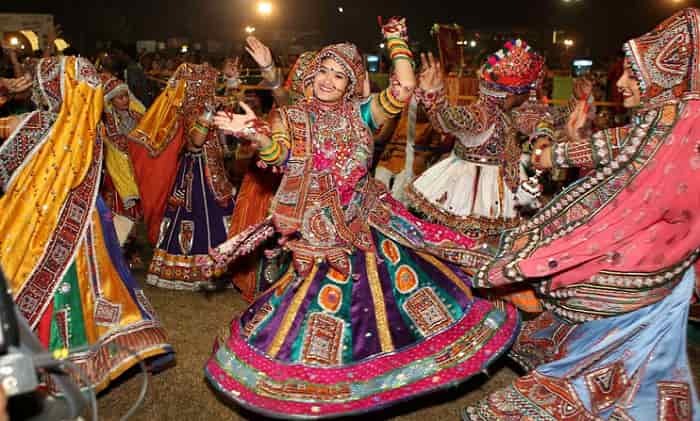 It is world famous for its Garba dance nights which is celebrated all through the nine day long festivities. Gujarat is decorated with great pomp and show and people indulge in festivities and enjoyment. In eastern part of the country, Navaratri is celebrated as Durga Pooja, in states like West Bengal, Orissa, Assam and Bihar. Kolkata’s Durga Pooja is the most famous among all. During the Navaratri Durga pooja festivities in eastern part of the country big pandals are built up where idols of Goddess Durga on her Lion , Lord Ganesha, Goddess Laxmi etc are kept where people visit and worship .Big Large sized pandals life size idols are kept and worshipped are the source of attraction in which creativity of an artist is displayed .It is one of the must have experiences during the lifetime. In southern part of the country , States like Tami Nadu , Kerala Nine day long Navaratri is also celebrated by worshipping Goddess Durga , Goddess Laxmi and Goddess Saraswati to bless us with blessings During these festivities people usually indulge in buying ne w assets new vehicles like cars , two wheelers also home appliance etc . Markets are abuzz with people shopping new things ,also marketers also offer new offers for the customers to attract them. In the northern states of the country like in Punjab, Haryana and Himachal Pradesh Navaratri is celebrated by worshipping nine girls and boys as kanjaka’s. They worshipped in the form of Goddesses and is presented with bangles , bindis etc.